When you wake up with that Monday morning feeling, a spot of crafting soon sorts you out - or was that the coffee?! 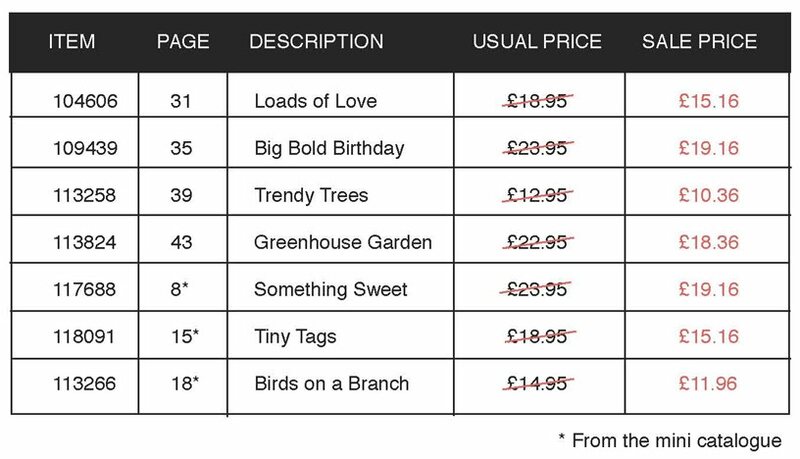 Anyway, today I'm doing something a bit quirky using Trendy Trees (which is one of the sets Stampin' Up are offering at a 20% discount this month - scroll down to the bottom of the post for more). The tropical heatwave we enjoyed yesterday has given way to murky autumnal weather so my thoughts have turned back to Christmas cards! Of course I could have just used the whole fir tree from the set to make this but I wanted something slightly bigger. So I scored and folded a piece of scrap card stock and cut a triangle out of it leaving behind a triangular template. I sponged ink inside this template and then stamped the trunk of the fir tree on top and hey presto! A new and exciting tree! Cut template and sponge and stamp tree (as described above) onto a piece of Whisper White card stock 5 cm wide x 6.5 cm high. Decorate the tree with coloured card stock circles cut with a 1/4" circle punch. Cut four scalloped squares and trim one scallop vertically off each. Stick them together with tape, and mount the tree panel onto the resulting mat. Wind linen thread round the bottom and tie a knot. Tear a piece of 'snowy' designer paper and adhere to a Kraft card base made from an A5 piece of card stock scored and folded. Stamp a sentiment across the card base and the dp. Attach the focal panel with dimensionals. Sponge the edge of the card base. Don't forget that Trendy Trees isn't the only two step stamp set on special offer this month. Have a look at the table below and consider snapping up a bargain. If you see anything you'd like, just drop me an email - I'm always happy to help. You are such a clever girl. Love the way you`ve worked the tree and I also love the tearing again. A pleasant change from tradition. very cas and very beautiful! This is a truly great card Vicky! I LOVB it! !Thanks for the tip about the scallops- I never knew how that was done !! Maybe now my scalloped square punch will finally see a bit of action! Love, love, love this card, Vicky! Your creativity just doesn't end. Love how you made that tree.